Have been making bento not just for myself but as in the 2nd brekkie bento post, I made for my sis too. Then I made one for hubby and took more time than I made for sis. This time I made something for the “boy” and could not use Hello Kitty or flowers. Went through my bento gears and found only this car sandwich/cookie cutter that will fit the masculine theme required. So I made him a cheese and ham sandwich. Had a bit of trouble cutting out the sandwich because of the ham. Don’t know if it’s because it’s not meant to cut through meat. 😉 In his bento are some sausages and cheese cocktail, held on together with two blue house picks (to remind him how lovely his home is..Hehe) and also some cocktail papayas and pear held together with a pair of papa and mummy duck picks (to remind him of us..Hehe). Also there’s two small little chocolate filled panda biscuit from Meiji once again as treats. 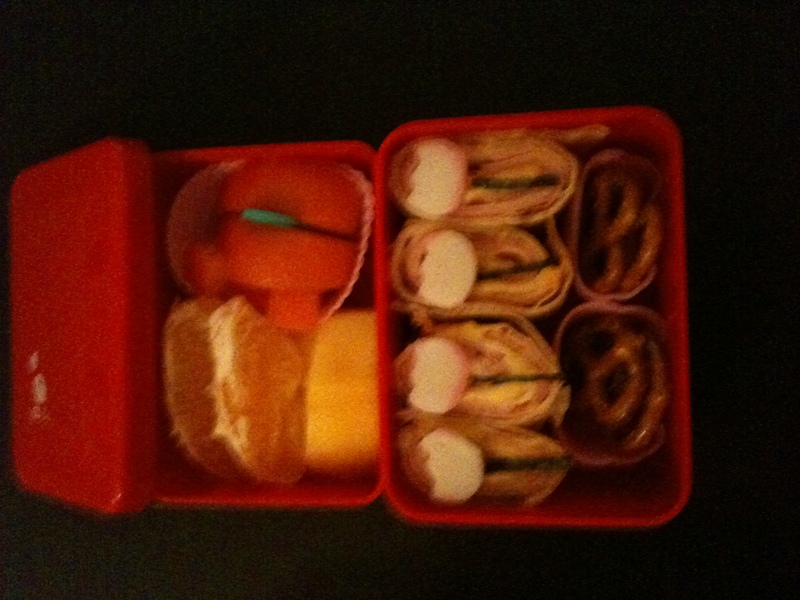 So far the above bento which posted on my facebook received the best thumbs up and am glad I spend that much time on it! I made the above for my sister and as she said it’s to show how much I love her. 😀 Well, I really did spend a lot of time on the above especially in cutting out the heart shapes out of papayas and Korean pears. Used a love cookie cutter for the PBJ sandwiches and since after cutting the three hearts that were a bit of space left and decided to use my Hello Kitty cutter that fit just nice. The bento box is kinda big so I had to put in some other mum mum and so I included some animal butter cookies from Marks and Spencer and two little strawberry filled biscuit from Meiji. These were actually bought for treats for my little girl. I’ve got some slices of sweet oranges too with two little hatchling picks. My sis loved it and ask for more but I said wait till I master managing my time. Haha! 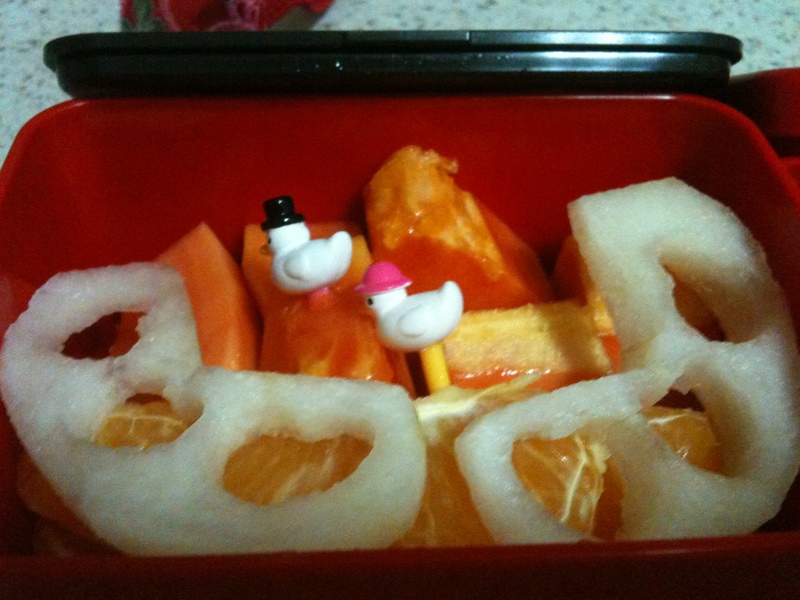 The remains of the cut out papayas and pears were used for my bento below. Mine is a 2-tier bento box which I got it from Daiso and my content is only slightly different in terms of the sandwiches’ shapes. I had the similar Hello Kitty and I have got the flower sandwiches. Oh and all the sandwiches were decorated with a chocolate pen which I bought from http://www.nst.my, another one of my online supply store for my bento making. My in-law’s are away holiday-ing in Alaska and Bahamas and left their little pompom “baby” dog dog in my care. The poor dog seems to miss my MIL very much and seems really down. So this time made a brekkie with the dog dog cutter. A very simple PBJ sandwich but instead of the normal bread, I used charcoal bread which taste heavenly though asthetic wise not that pretty. 😉 Made two bentos, one for myself and another one for hubs. This time didn’t make anything fancy for him just dried meat sandie and had the same side condiments i.e. cherry tomatoes, corn-on-cob, two color grapes and some little mangoes. 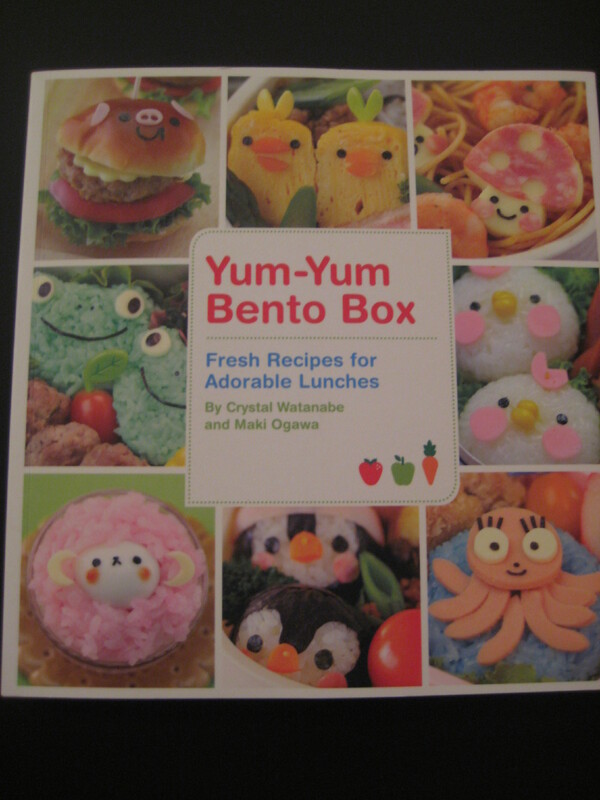 I’ve also bought the much raved about bento book, Yum Yum Bento Box and am really inspired to try out all of the design in there. But then again most of the meals seem to be more suited for lunch and hence will need to improvise. Overall, the book is really cool and hence has started to follow the writer, Crystal Watanabe a.k.a. “pikko” on Twitter to tap into more of her creativity! 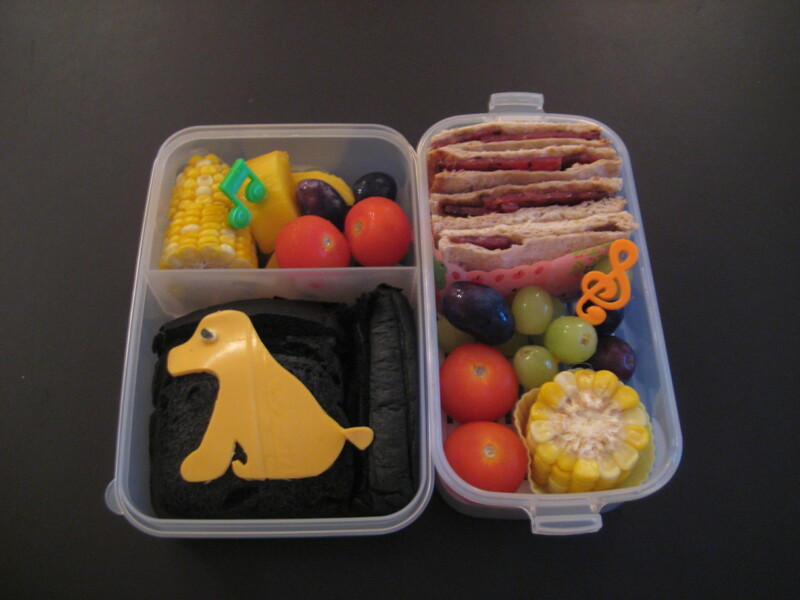 This bento was inspired by a cool bento maker, Shopping mum (www.motheringcorner.com). Thanks to her step by step guidance, I were able to successfully made the this morning kawaii brekkie. Made the hat with the red portion of the crabstick and the ears from grapes. I were suppose to put the ears in with spaghetti strips but just realised last minute that I didn’t have any. Phew, found some dry soba noodle!! Worked well too! Wanted to put a little star button for one of the pau but it didn’t stick coz it was frozen and wet.The facial expression really add a lot of difference to the creation. Once again got those really heavy good looking puncher from http://www.bentocraft.com that did the miracle. On another tier are the usual healthy fruits. My pictures seems a bit red and will need to learn how to make them look better. This morning I only had to make one brekkie bento for myself as hubs had training at the office where they serve them 4 meals during the day. 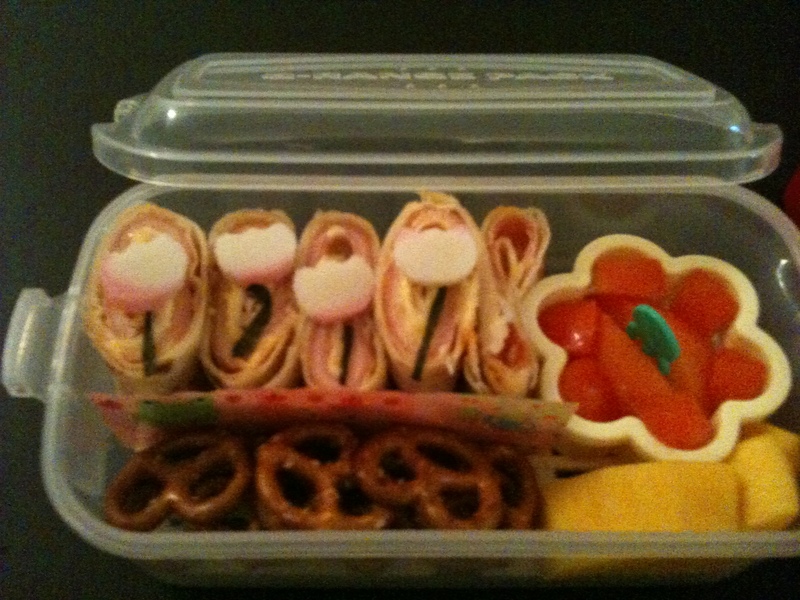 But still I took awhile to make the above bento. 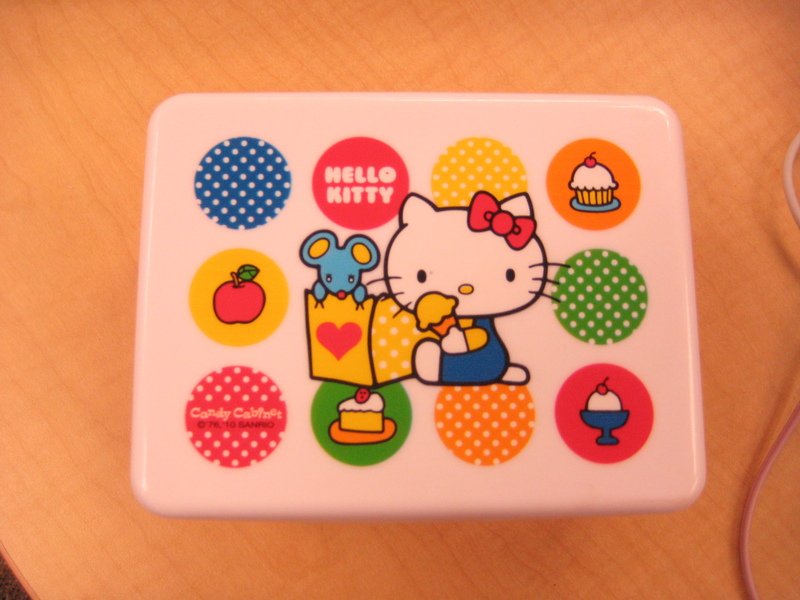 Used the Hello Kitty Sandwich Box that I just bought from http://www.bentocraft.com. Love the service from this site as my orders were delivered to me less than 24 hours!!! Will definitely purchase more from this site because they do have a lot of variety and I got a free gift from Carmen who runs the site as I’m a returning customer. Okay this morning’s meal is made out of wheat flour waffle. It was kind of difficult to cut out the kitty face with the kitty cutter as I toasted the waffle first before cutting. The waffle was already cripsy from the toaster and hence cutting it created loads of crumbs on the kitchen counter top. Next time I’ll be smarter and cut it before toasting. The kitty face don’t really look like the sauce container Hello Kitty (has got really tasty yummy manuka honey inside) coz I believe the eyes should be further away. For the fibre portion of the bento I had two cherry vine tomatoes, green apples, some grapes and three tiny orange slices. Also had a little box of raisin under the kitty sauce container. 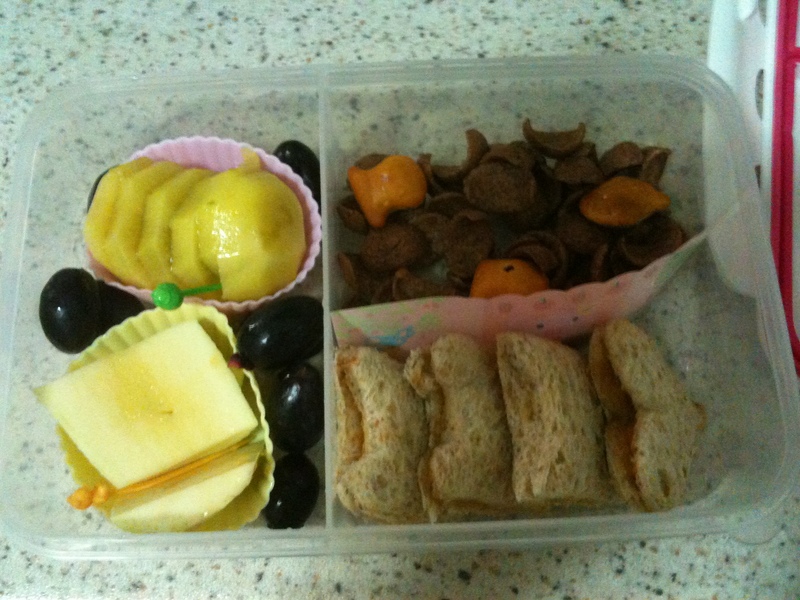 All in all again I think practice makes perfect and also I think I really need to start planning my bento earlier i.e. as advised by all other professional bento maker out there, draw it out if possible and you’ll save a lot of time. Next am planning to make a bento to promote a girlfriend’s site that sells really great looking custom made jewellery from beads and swarovski crystals. 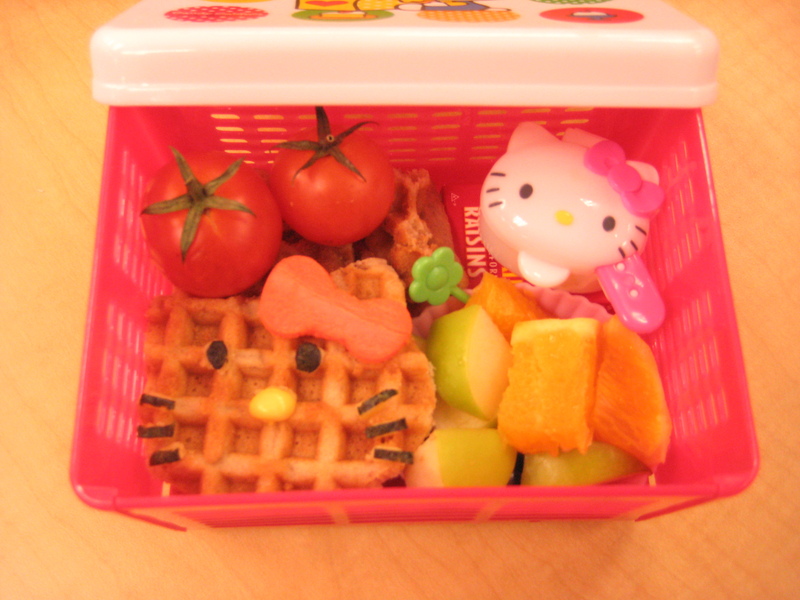 Till then, happy bento-ing! My very first brekkie bento was made probably about a month ago. Actually bought all my tools for quite a while and tried out mostly the egg moulds but didn’t really make a real bento. Anyway, made my first and looking back at the progress after that, hmmm..I have to say “not bad’! 😀 The items are quite simple because menu for breakfast seems quite limited and till now I’m facing some challenges in coming up with new breakfast bento..(hence the one or two bentos a week instead of 4 a week when I first started!). 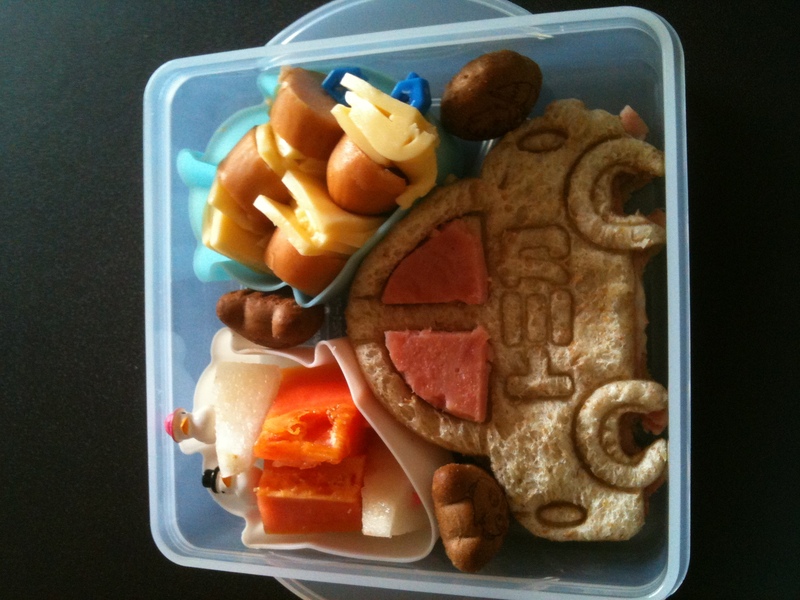 The first bento has small cut out PBJ sandwiches. The shapes are heart and cat. Didn’t have the time to do any facial expression on the cat hence, they don’t really look like cats. Have got mangoes, grapes and kiwi to add colours and little cococrunch cereals and three little strawberry filled fish biscuits from Meiji (my daughter loves this! Especially the chocolated filled ones). The cococrunch cereals got a bit soggy by the time I ate them in office (about 2 hours after). Believe it could be because I put them next to the sandie though seperated by the cute baran. Am still thinking how I can keep them crunchy if I wish to pack them again next time. This would be my first blog post and am planning to have more post as time goes coz it’ll then be evidence of continued development in my bento making. It is also my love for all the cute, beautiful, wacky and really cool looking bento that got me to learn about wordpress. 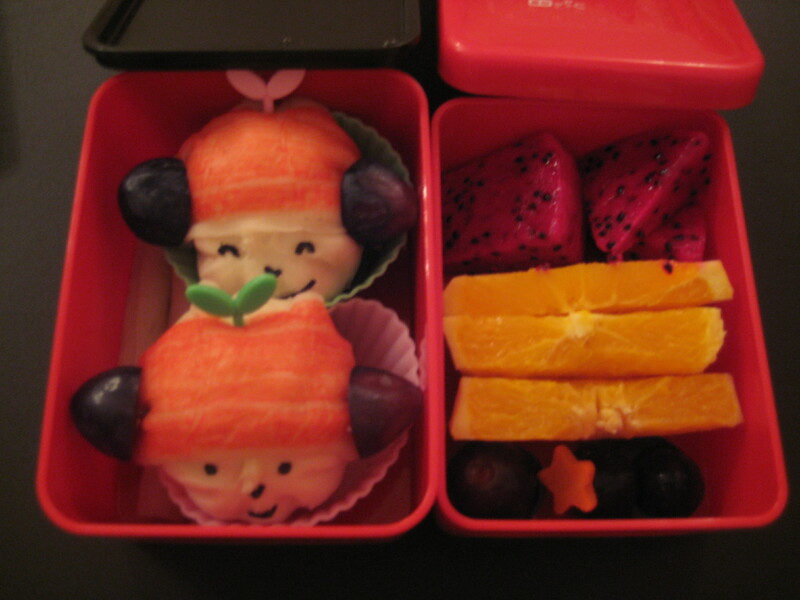 Am still new to this and hope I shall be able to master more about blogging and of course my bento making. 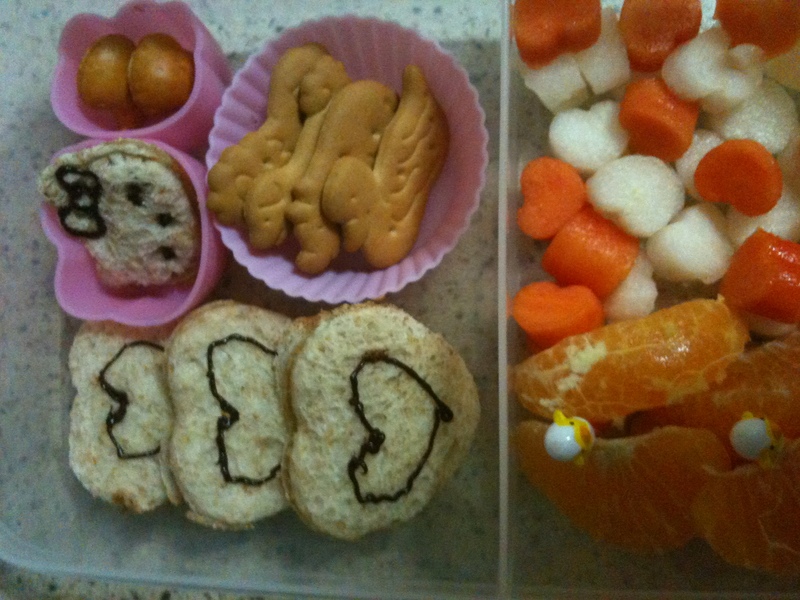 Am putting up the picture of today’s breakfast bento that I made for both hubby and I. Have actually been doing breakfast bento instead of the usual lunch bento because I still love having lunch with colleagues at work and also the chance to leave the cold cold office. So breakfast bento it is for now. The above is made for hubby. It consists of tortilla with ham, cheese, tomato sauce, mayo rolled and toasted. On the side in the flower cookie cutter is half a tomato and some mango on the outside. Bought this little pretzels from Cold Storage coz am trying to make healthy brekkie and so here goes into the box for hubby. Actually hubby is not very supportive of my bento making because I wake up really early (this morning at 530am!!!) just to make them. Also his friends had been laughing at him looking at the post in facebook that I made of this brekkie and he’s embarassed about it. This actually really hurt and I did cry a little this morning when he seems reluctant to have the bento. But then he did apologize for not being sensitive. Anyway, am not going to let this stop me from bento-ing! Below is mine. The stuff are usually the same. 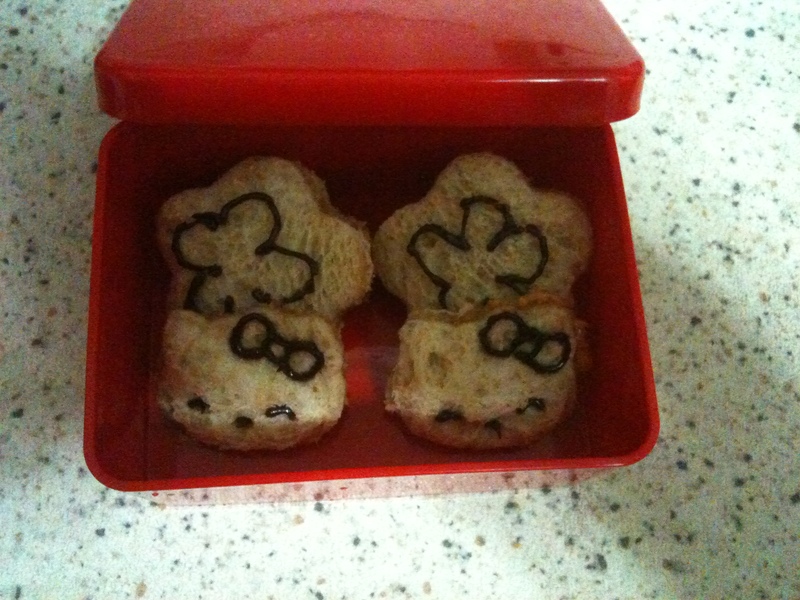 But I tend to spend more time on hubby’s bento than my own (that’s why it hurt so much when he don’t want them!! *sob**sob*). Oh, the tulip flowers are made from kamaboko and the stalk are from nori. I’ve addition of two slices of oranges coz there were more space :). Overall this is tasty but a little bit salty. Next time I’ll skip the butter on the tortilla. The little pretzels were great and shall let my little girl have it for snack next time instead of biscuits. That’s all for my first post. Shall upload the rest of my breakfast bento in my next post.